How are you progressing with your New Year’s Resolutions? You may have started the year with great intentions for improving the quality of your life or achieving specific goals. But by the end of January, if you’re like most people, “life” has gotten in the way and your New Year’s Resolutions are long forgotten. Fortunately, there’s a much better way to manifest what you want. It’s called a Passions Vision Board. And it works! It’s a powerful tool for reinventing your life, especially after a life-shaking transition like a divorce, job layoff, career change, retirement, or empty nest. If you want to see an example of a vision board methodology that works well (and see real proof of the results), learn how to create a vision board for yourself, and understand why it’s so effective, keep reading. I first discovered how to create and use a vision board several years ago, when I was going through a traumatic divorce and career meltdown in the same year. It was such a life-shaking transition that I had no idea how to pull myself up and out of my misery. But in those rare moments of clarity during that tumultuous time, I asked myself what I wanted to do for the next 50 years. And the answer was clear as a bell … that I wanted to follow my passions. But I didn’t know what my passions were, nor did I have any clue as to how to pursue them. Imagine my excitement when I found a 3-day seminar on finding your passions! How timely it was. I learned how to explore what kind of things I truly enjoyed and valued, and was able to identify my Top 5 passions. I also learned how to create a Vision Board the traditional way, which is to use a large poster board and paste pictures cut out of magazines. I settled into my new San Francisco home, surrounded by magnificent scenery. I made lots of new friends in San Francisco and have been enjoying a very active lifestyle here. My coaching business started to take off. 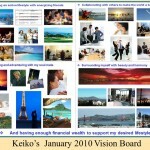 Since then, I’ve updated my Top 5 Passions and my Vision Board every 12-18 months … because it works! And my life has gotten better and better. You can use this powerful tool too, just by following some simple instructions below. Step 1 … Use the Wings for Women® Passions Discovery Guide to identify your top 4-5 passions. Click here to access this tool. Make sure to allow at least one hour of uninterrupted quiet time to do the exercises. Step 2 … Find digital images online that resonate with you and portray each of your top 4-5 passions. GoogleImages is a great place to find a wide variety of images using key words to search their archives. Copy and paste the images onto a PowerPoint page. Shrink the images and arrange them nicely so that they all fit onto the page. A Vision Board works because it focuses your attention on what you want with such clarity that you can actually feel yourself living in that picture. That emotional connection with your vision creates a vibrational frequency of energy that can attract the right opportunities, people, and resources to your life … but only if you truly believe that it will happen. That sense of relaxed “knowing” is important, because if you have doubts about your ability to make it happen, then it won’t happen. 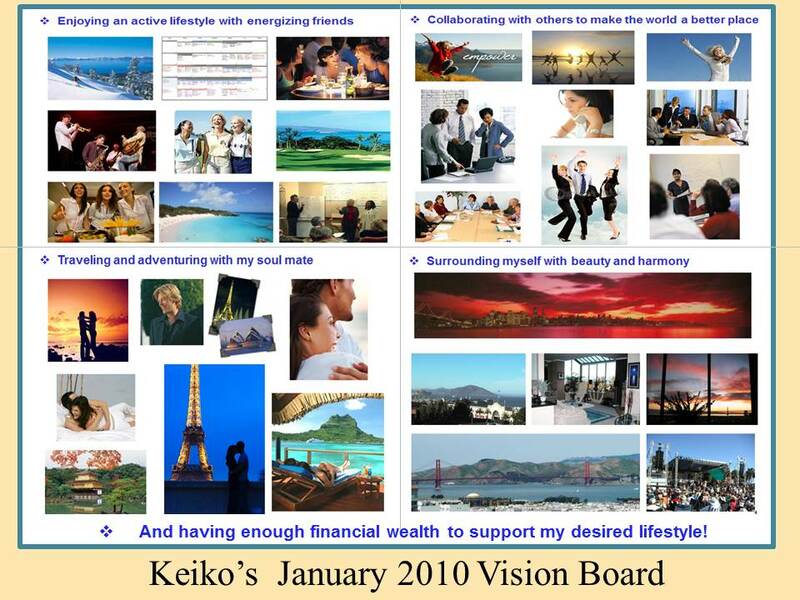 What’s especially cool about creating a Passions Vision Board on a PowerPoint page is that you can print out copies and hang them up on your walls, keep a copy in your purse, share it with your friends. And every time you show your Vision Board to someone and explain your passions and the pictures on it, you raise your vibrational level even more, which increases your probability of manifesting what you want. I keep one copy on my bathroom wall and look at it every morning to remind myself of what’s important. And I share it with my friends every chance I get. Create a Passions Vision Board for yourself. It’s a great way to start the new year on the right track! Find Your Wings, and Soar! Is Your Inner Critic Holding You Back? 5 Tips to Managing That Inner Voice.